For anyone playing the upright bass (and uses a bow) it can get really confusing when it comes to choosing a good bass rosin. There are a few 'old mainstay' (et al, reliable) rosins that work and there are all also a lot of different rosins out there that quickly make a player crazy trying which to decide on. Let's go through a few basic principles of rosin and more directly, BASS rosin. What's the difference you ask? Bass rosin tends to be made so that the rosin is stickier than it's violin family relatives, like the violin, viola and cello. One of the first elements in choosing the right rosin, is the climate. A lot of the time, one brand of rosin may work well all year round. Some climates that have super hot and humid summers and then extremely cold and dry winters, may require a completely different brand that will work according to the season. In other words, it's ok to have and use two different brands of rosin depending on the time of year or season. We here at String Emporium sell at such incredible volumes that we never have to worry and in most all cases, we buy directly from the maker(s) and not a distributor. Doing it this way we have far better chances of getting the best, most recently produced. 'Fresh' is key! Here is a quick link to our bass rosin order page. Pops Pops rosin is easily the best selling and most popular bass rosin in the world. It comes in the unmistakable red plastic container and is consistently good, reliable rosin. It is popular because it often works just about everywhere. This rosin works and after you put it on, you're good almost for the whole session, if not the whole day. It tends to stay consistent on your bow. Cons: Be careful and don't over do it. Just a little can go a long way. (Sometimes if you want more "pop" on the isolated area where you are playing (like an orchestra kind of spicatto) on the bow, it's ok just to put a little extra on that area that it is being played on, rather than the whole bow. This way, your hair won't collect (un-used) rosin over time and will last longer. Also, sensitive players think that sometimes the Pops will 'coat' or interfere with the tone between the hair and string. (see solo rosin) This is why some keep a bow strictly for orchestra and one for solo work. What if you have new hair and it gets 'glossed' over with too much rosin. How to clean bass bow hair. Wiedoeft Wiedoeft rosin just came out (in late spring, 2018) It's somewhat similar to Kolsteins and Pops rosin. It comes in this rubber latex type box. Needed improvement: They should certainly keep This to us, is a softer type rosin. Nothing like a Carlsson or Nymans. It falls in between Pop's and Kolstein Soft, with it leaning a tad closer to the K.Soft side and feel. It grabs like crazy and will not 'cool off' like Kolstein might. By cool off, we mean that somtimes the Kolstein's will feel just great at first, but then 15 minutes later, that super grab tends to dicipate a bit. With the Wiedoeft, it stays far longer. Also, we find that with Pop's rosin, it too stays more consistant, without too much of a 'cool off'. While it is early on (just came out), we would say this is not a rosin to use in the summers in most parts of the USA. Also, with this rosin, the old saying, "Less is More!" comes to mind. Especially this one, use it sparingly until you get a good feel for how it works. Nymans or Carlssons Why did we put these two brands in the same box? Because they are the same exact recipe. If there is someone out there that can 'just tell' the difference, I will would only point to a possible freshness date or vat. Same company, same recipe, same rosin! I like the Carlsson because if has the nicer plastic canister with a snap on lid. (Like the Pops has.) These two rosins also do really well through out the year and also reliable, popular rosins. They are not as soft as the Pops and there is less risk of hair glossing. Sometimes they can 'cool off' a bit after a break and might take a little more playing to get them going or a little more put on. Kolstein Soft We sell a lot of this stuff! It's good rosin. Just about everyone in the world get's cold, dry wintery weather at some point of the year and when your Pops or Carlsson/Nymans won't get it done, perhaps the Kolstein Soft will work. Be careful with this stuff, the softer you go, the more risk to 'glossing' the hair. Again, in the cold, dry winter, this rosin seems to really grab. We've noticed that it's great to apply (on the stage) before you start playing. I like to put it on just before I play the concert when I know that I am going to be going for the next hour or so.Don't use this in the summer and easy does it (even in winter) especially with new bow hair. When it is only 10% humidity and cold, this will work when no other rosin will. Kolstein All Weather Good Marketing! It's less soft than their "Soft". The All Weather stuff is just a harder rosin than Kolstein's Soft. So it is less risky to use in hotter, more humid climates. Not so great when it is cold and dry outside. We (players) here, like to use this brand more the first few days after a re-hair because the hair will have a better chance of NOT getting too waxy or glossed over at first. Then later, after the hair is more 'broken in', you can switch to a more softer brand if you like. What about age and freshness? Ok, here is where I give our little spiel about freshness and not being a cheapskate! I can remember when I was in (high school and college) I thought that as long as I still had any rosin left, it was fine to use. Because we are always trying out new bows here, I can wholeheartedly attest that freshness is the most important key component of any of the softer bass rosins. Always order your new rosin from a bass specialist. Pops rosin used to have a born date (when made) so that folks can see and know how fresh it was. I think Pops was honest to do that, but also, most shops didn't like that because they'd end up buying too much or not selling it fast enough. People were checking those dates!! The dates have now disappeared from them again. Most of the soft (Pops, Carlsson, Nymans and Kolsteins) should be replaced about once a year. As a professional, I buy new rosin at least once a year. One cake of rosin is way cheaper than a re-hair and so much easier. You can really hear and feel the difference. For folks buying new bows with us I will almost always insist on sending out some kind of new and fresh rosin. Why put old, dry, scratchy rosin on a new, good bow? About hard rosins. You may have read (in the Pop's Pros and Cons) about some players keeping a bow for orchestra and another one, for strict solo playing. The orchestra bow using one of the typical bass rosins and for the solo playing, using a harder rosin. Violin or Cello rosins are made in a harder formula. Anyone that has just gotten a new re-hair on their bow, can attest that the tone is more apparent, more pure at first while the hair is new and before a lot of the waxy bass rosin goes into the hair. As orchestra players we want 'big', 'full' and loud. I also want the bow to 'speak' (I want a nice 'machine gun' spicatto). The trade off is less contact between hair and string, where the rosin helps grab the string, it also covers the tone. For strict solo playing, (like a Bach Cello suite), using the cello or violin rosin, will allow the bow to be more even throughout the whole stick. There are some definite differences between the two types of rosins, but again, it is hard to notice if you already have used bass rosin already on your bow and then trying out the cello/violin rosin. Maybe the next time you get your bow re-haired, it might be fun to try this experiment and use some cello rosin the first couple of days. All the more reason to be nicer to the 'upper string' people around you so that you can borrow and try their rosin first! 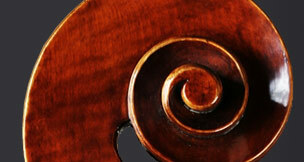 Popular violin, viola and cello rosins: Bernadel (cheap and it works), Hill light or dark, or the Larica brand. Larica has different hardness formulas (starting with I as the hardest), and end up at a formula V which comes in a tin. Wit the tin, it tells us that the Larica company think that it is soft enough to need that. Don't buy these hard rosins if you are going to play or use your bow in an orchestra and only using one bow. The harder rosins are not enough to make it work with the real power that you'll need. In general most people want and need that bass string to really vibrate and for the bow to quickly grab the string. As with anything, a little trial and error will help you decide which kinds of rosin you like to use and why. While it is hard to use just any one kind of rosin year 'round, it's fun to pick up a 2nd, different bass rosin, for spikes in the weather seasons and whatever the case may be or brand you choose, newer, fresher rosin will always be better.